Touring Exhibit Forced From Ho..
No Justice, No Seat: Survivors..
Sports used to be a pastime that transcended political differences and brought people together, but with rising political temperatures, that sentiment no longer seems to exist. From the NBA relocating its All-Star Game in North Carolina due to the state’s transgender bathroom legislation, to the polarizing topic of kneeling for the national anthem, there is no doubt that politics is now the center everything. For background, Kaepernick has not played football since 2016, and has remained a free agent since the start of last season. Early in his career, Kaepernick impressively lead his team to the Super Bowl and ranked fifth-best in passing touchdown to interception ratio. However, during his last season Kaepernick had a 59.2 percent completion rate and of qualifying quarterbacks, he finished last with less than 190 yards per game in 2016. But Kaepernick is not known for his record. Colin Kaepernick is most known for starting the protest of kneeling for the national anthem back in 2016, which is exactly why Nike chose him as the face of their newest campaign. 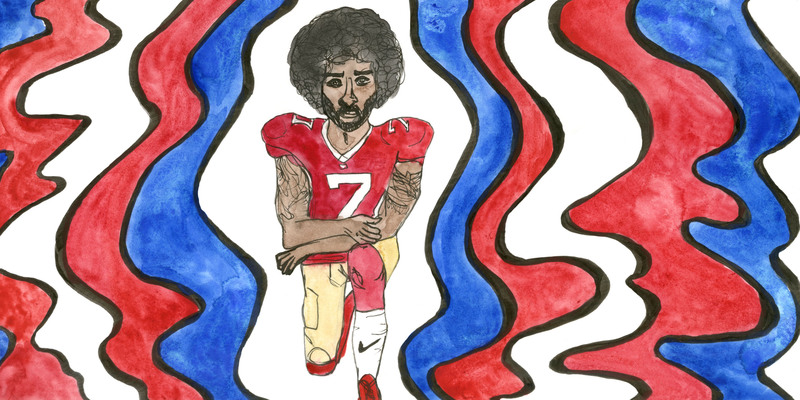 Nike’s decision to feature Kaepernick may simply be a marketing tactic, but the move further demonstrates how politics is now a part of everything. After Nike’s decision, some on the right called to boycott the company and burn their Nike gear, while others praised the company for their decision to highlight someone like Kaepernick. By taking a knee during the national anthem, Kaepernick began his protest against police brutality and racial inequality in the United States on national television. Kaepernick has further made his politics clear by wearing socks depicting cops as pigs, a t-shirt of Cuban genocidal Communist Che Guevara and a Malcolm X hat. Conservative media personalities criticize Kaepernick for being ignorant of history and as unable to make a clear and convincing argument for his protesting. President Trump called those who kneeled for the anthem “son[s] of b—[es],” but this just created more of a spectacle, resulting in more and more players taking a knee in protest. Trump did not start this culture war, he just exacerbated it. Kaepernick tried to start a movement back in 2016 that most players and Americans did not like. It was basically dying out — until Trump made a comment. A September 2018 poll by NBC News/Wall Street Journal revealed that 43 percent of voters believe kneeling for the anthem is an appropriate way to protest racial inequality, while 54 percent say it’s inappropriate. These numbers have remained fairly consistent from when the protests began until now. However, what has changed is the deep divide between how Democrats and Republicans view the issue. 72 percent of Democrats say kneeling is appropriate, while 23 percent disagree. For Republicans, the stats are basically the opposite. 88 percent say the protests are inappropriate, while 10 percent say they are appropriate. The divide between party lines shows how the anthem is now a left-right issue. And it’s not just at football games where politics has become the sun that everyone orbits around — ESPN also decided to make politics their central focus. Ben Shapiro has called ESPN “MSNBC with footballs,” and for good reason, too. Last year, ESPN laid off over 100 on-air employees, which included almost the whole NHL reporting team, also getting rid of Baseball Tonight. Why? Because those have little to do with politics and ESPN spends most of its time reporting a left-leaning political agenda. Jim Brady, ESPN’s public editor, stated, “The desire to draw a boundary between sports, culture and politics is a fool’s errand…. The volume of non-sports content within ESPN’s empire has increased significantly in recent years.” Part of this is designed to pander to a certain audience, which often neglects a large portion of those who just want to hear about sports on the sports channel, and politics on the news channel. However, ESPN has blurred this dividing line. As the new football season beings, players in the NFL have again decided to kneel for the national anthem after the football league stated it won’t implement its new national anthem policy this season. The new policy allowed players to stay in the locker room during the anthem, but, if they were out on the field, they would have to stand. Ratings for the NFL and ESPN are down overall, and while it cannot be singly contributed to the politicization, it is definitely at least one reason for the dip. If the neither the flag or the national anthem or sports unites us, then what does? Sports and the anthem have become left-right issues, further polarizing the nation. Those who kneel for the national anthem will be praised by the left for speaking truth to oppression, while those on the right will say those who kneel are being unpatriotic and disrespectful. If the protests have demonstrated anything, it is that this culture war is deeper than sports and one that has been brewing long before Trump took office. Without a sense of commonality, people no longer see their neighbors as fellow Americans, but as enemies. Once politics becomes everything, we grow further apart and focus on what divides us rather than what unites us. We need spaces that are politics free and symbols of unity. The less we see those who disagree with us as our neighbors and more as our political opposition, the greater the divide becomes and the greater chance of the country becoming irreconcilable.